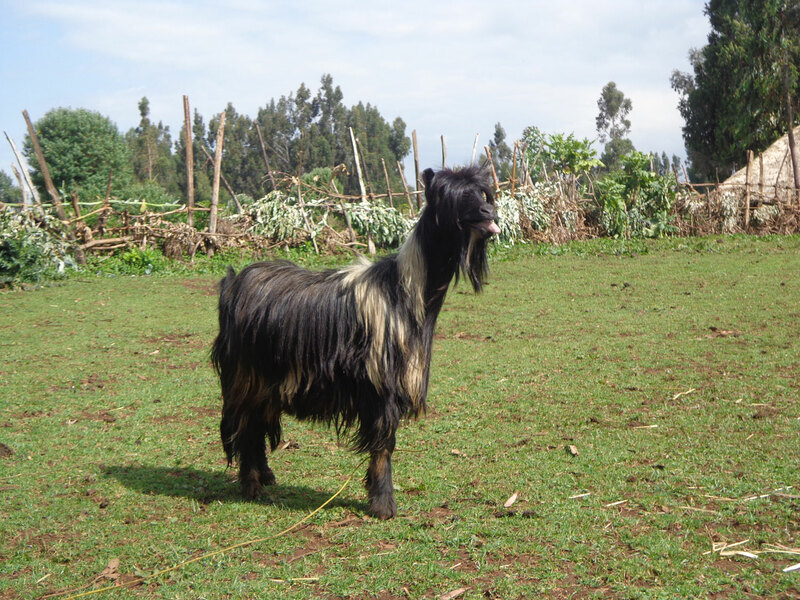 A Review on Current Knowledge of Genetic Diversity of Domestic Goats (Capra hircus) Identified by Microsatellite Loci: How those Efforts are Strong to Support the Breeding Programs? Mekuriaw G, Gizaw S, Dessie T, Mwai O, Djikeng A and Tesfaye K.
Genetic characterization requires knowledge of genetic variation that can be effectively measured within and between populations. It is considered as an important tool for sustainable management or conservation of a particular population. Presence of limited diversity may hamper the possibility of populations to adapt the local environment in the long term, but loss of genetic diversity can also more immediately lead to decrease fitness within populations. In this paper, genetic diversity of more than 120 domestic goat populations found in various parts of the world has been summarized. The paper is limited only to the diversity study conducted by microsatellite loci. In all the goat populations reviewed, the within population genetic diversity is extremely higher than between population variation which might be due to the uncontrolled and random mating practiced among the breeding flock. However, the technical as well as statistical data management deficiencies, like selection of microsatellites and other sampling biases, observed in the reports could have their own influences on the limited and weak variations obtained within and among populations. The genetic distance among populations is very narrow especially populations found within states. In general, goats are the most transported animals during the lengthy commercial and exploratory journeys took place in the old world long time ago. This contributed the goat to have narrow genetic differentiation compared to other ruminant livestock. The technical fissures observed in the past efforts on identification and structure analyses of the goat populations might also demand further works to design appropriate conservation and breeding management programs. Biological Basis of Personality: A Brief Review. Khatibi M and Khormaee F.
This brief review discusses the research on biology-based personality and personality theories with biological basis. These theories include Eysenck's three factor model of personality, Gray's reinforcement sensitivity theory, and Cloninger’s model of personality. The biology-based personality research is a relatively new topic in the field of psychology and there is a lot of scope for further research in the future specially in the field of neuroscience. Although it is a relatively new topic, but growing in interest and number of publications. Only recently in August 2004, there was a conference specifically on this topic, called “The Biological Basis of Personality and Individual Differences”. This was a good forum for presenting and sharing of ideas between psychologists, psychiatrists, molecular geneticists, and neuroscientists. Recently it was named as the field of 'Personality. Therefore, further research on the biological basis of personality, especially in the field of 'Personality Neuroscience' is recommended. Vertical Distribution of Phytoplankton Communities in Gondang Reservoir, Lamongan, East Java, Indonesia. Cahyanurani A’B and Mahmudi M.
Human activity are increase recently around the Gondang Reservoir, Lamongan and cause increased of discharges waste that could potentially degrade the quality and function of the reservoir also changes the composition, abundance and distribution of phytoplankton communities. This study aims are to determine the vertical distribution of phytoplankton community and use it to assume the waters fertility rates in the Gondang Reservoir from January to February 2016. This study used survey method by taking samples of water and phytoplankton in three observation stations (inlet, middle and outlet) and 5 depth of 0 cm, 50 cm, 100 cm, 150 cm and 200 cm with 2 times of observation. Phytoplankton that has been found consist of 4 divisions, i.e. Chlorophyta (31 genera), Chrysophyceae (14 genera), Cyanophyta (7 genera) and Pyrrophyta (3 genera). Total abundance of phytoplankton ranged between 111-2.557 ind/liter. The highest abundance from all stations are at 50 cm depth where the light intensity is optimum and phytoplankton abundance decreased with increasing depth. Phytoplankton diversity index (H') ranged from 3,31755 to 7,82316 indicating that the diversity range is moderate to high. 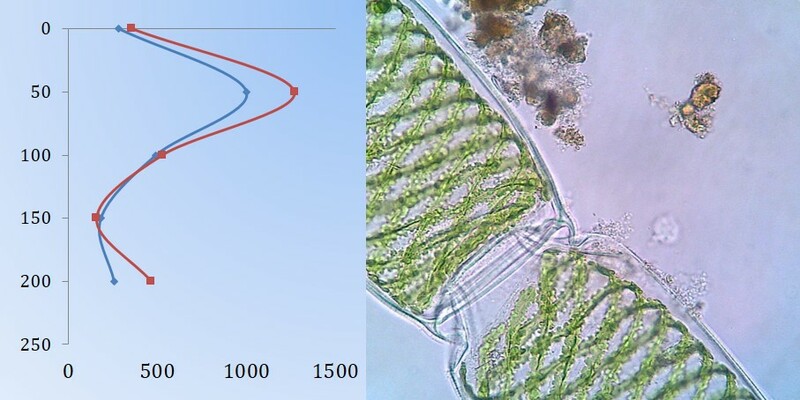 Water quality parameters such as temperature, brightness, pH, DO, nitrate and orthophosphate is good to support phytoplankton life. The overall observations indicated that Gondang Reservoir are including in mesotrophic waters. In conclusion, the vertical distribution of phytoplankton can be used as a parameter to asses the water quality in Gondang Reservoir.